Find out how the Knorr Chicken Powder enhances the taste of your dishes without masking its natural flavours! A versatile seasoning made with real chicken to boost meatiness in many applications such as soups, stir-fried and fried dishes. Use 20g of Knorr Chicken Powder for 1L of water or 1kg of meat. 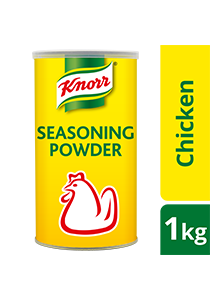 For Stir-Frying, Marinating and Seasoning: Sprinkle desired amount of Knorr Chicken Powder Seasoning Mix to improve flavour and taste of foods. For Stock: Dissolve 20g (2 heaped tablespoon) of Knorr Chicken Powder Seasoning Mix in 1 litre of boiling water. 1 pack makes 50L of stock. Most chefs prefer Knorr Chicken seasoning powder because of its rich meaty flavor. Best for Yang Chow Fried Rice. Ideal for marinades and seasonings.